Staindrop’s earliest History begins in neolithic times, although most of that ‘village’ will be under the current housing. Expansion of the village is thought to have taken place in Roman times evidenced by the nearby settlements and roads. However, the first Church dates from the time of Alhred, King of Northumberland, with a saxon building dating back to 771. Little is known of Staindrop in this period as its recorded history doesn’t begin until the early 11th Century, when Staindrop was the home to a Manor of King Cnut (Canute II) which he gave along with all the ‘appurtenances’ to the newly founded priory at Durham . This church would have resembled the nearby church at Escomb and is understood to have been some 38’ by 19’ with a 12’ chancel. The only very early piece of work left is the sundial now built into the wall above the chancel arch in the near the corner with the North arcade (although there are some carved remnants on the external North Wall buttresses). This early building is thought to have been enlarged by Canute taking the Nave westward and by erecting a tower. Evidence of this period can be found in the remnants of two windows on either side of the Nave at the end of the first bay. For 100 years the church and lands passed between the Bishop and Monastery at Durham, as each wanted control of the area, and the wealth that went with the lands. In 1131 the Manor and lands were then granted to Dolfin or Dolphin the son of Uchtred (descended from the old Earls of Northumberland and Kings of Alba). It is then that the first priest of the parish is recorded - Aldwin. Dolphin was later styled Lord of Raby, suggesting that the Manor of Staindrop was being replaced with one at Raby - this manor at Raby would eventually culminate in one of the most magnificent castles in England. In turn Maldred was succeeded by his son Robert Fitz-Maldred who married Isabella Nevill a wealthy Norman heiress. (It was their son Geoffrey who took his mother’s name of Nevill which thereafter became the family name. From this expanding wealth and power the church at staindrop was a major benefactor through the next few centuries. Between 1250 and 1260 the church was extended westward again the tower rebuilt in its current position but heightened later. 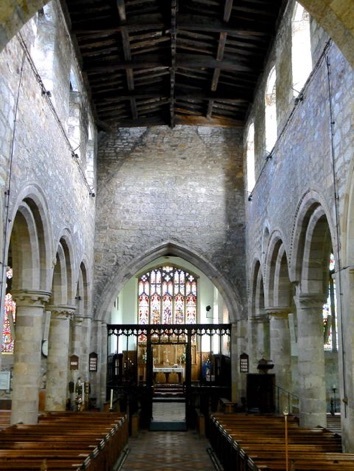 At this time too the transepts were added providing a traditional cruciform 13th century church with its high pitched roof and lancet windows. By the end of the century the aisles had extended westward to encompass the tower and the double tiered vestry built with an upper room serving as a hermit’s cell. (John de Cameva is recorded as hermit of Staindrop in 1336). In 1343 Ralph Nevill (2nd Baron - of the Battle of Neville’s Cross fame) was granted a licence to found and endow three chantries at the church (it is this grant that reveals that the church was actually dedicated to St Gregory, it is thought that the later College being dedicated to St Mary proved a more popular choice after the reformation). 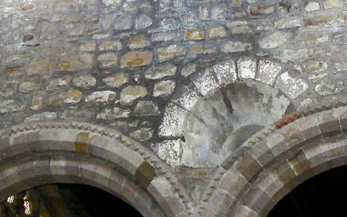 To provide space for these the South aisle and transept were taken down and rebuilt with Ashlar stonework. 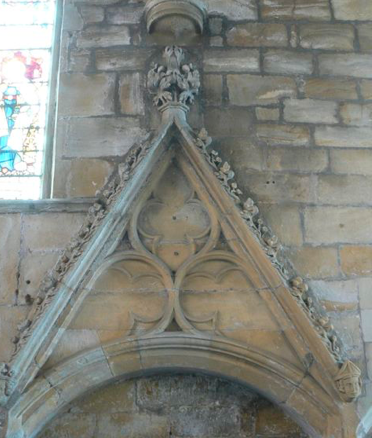 Also at this time the little vestry was built to serve these and the south porch created. This area provided the burial space for his mother and later Neville Ladies. 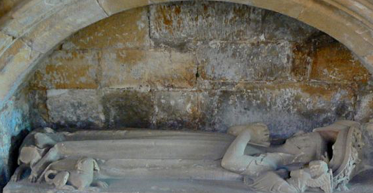 The effigy of Euphemia de Clavering can be found here under an elaborate canopy in the South Wall. 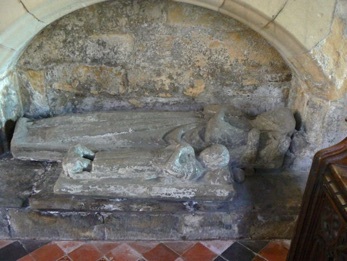 Adjacent to this effigy on the West now lies the effigy of Isabella Neville placed here when the figure was discovered in a restoration programme of 1849. To the East the Sedilia is the original seating from the original building of the South Aisle. Ralph’s grandson also Ralph (1st Earl Westmoreland) was granted licence in 1408 to establish a college at Staindrop. It was sited on the North side of the Churchyard by Langley Beck by inference on the grounds where the Mausoleum now stands. John Alwent was the Rector of Staindrop when the College was founded. He resigned in 1412 and the college as the Rector appointed Will Horne as their first Vicar. 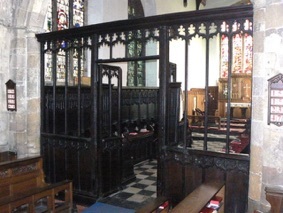 With the establishment of the College the church gained a greater dignity and importance which Ralph embellished further by erecting the chancel choir pews (with misericords), the 14th Century screen was retained. this was then mirrored in the Nave, with the clerestory being added at the same time and again the steep pitched roof giving way to the current shallow pitched roof. It was also at this time that the tower took on its current height and dimensions when it was raised by the addition of a new chamber. 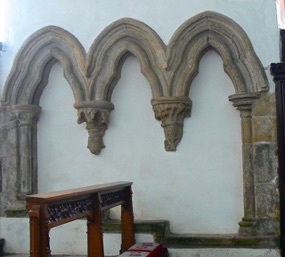 The building by now would have appeared oddly out of balance with a single transept on the north and the oversized aisle on the South, so sometime in the 15th Century the North wall was taken down and moved Northward although not copying the fine ashlar stone work of the South Aisle. chancel the sedilia dates from before these alterations being retained from the old chancel. 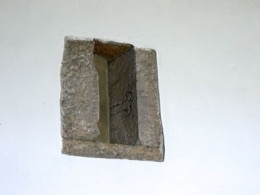 On the opposite side a small slanting window can be observed which was the hermit’s window, allowing him to look down on the high altar without being observed. The windows all date from different periods, but most of the glass is Victorian with some small pieces of old glass in different areas. The East window is Victorian designed by John Cory. 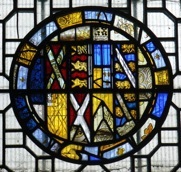 The glass being supplied by Messrs. Warrington of London and donated by Henry, Duke of Cleveland in 1855 (his family coat of arms can be seen at the top of the window). Earl of Westmoreland and his wife the daughter of the Duke of Buckingham (originally these fragments were in the old East window). Among the other windows can be found three by Kemp. The Reformation saw many changes in the fortunes of the Church. Its benefactors were lost as the Neville family fortunes waned. The church began to fall into disrepair the college was dissolved, its buildings and furnishings plundered, the large chest in the Nave was the only item retained - apart from the chancel furnishings. However in 1626 Sir Henry Vane an important member of the royal household purchased Raby Castle from Charles I and petitioned the King to become lay Rector of Staindrop. 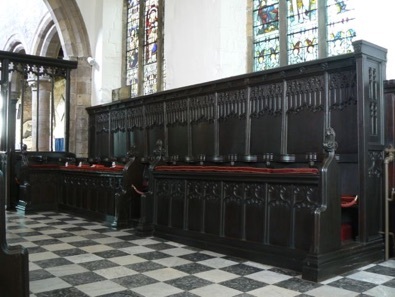 Through this new benefactor and his successors the church was saved and restored the Altar which was destroyed in the reformation was replaced with the current wooden table. 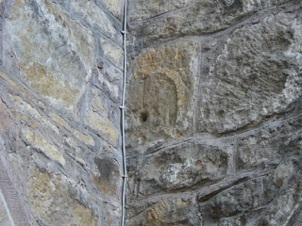 Repairs were carried out to prevent the church from deteriorating and so the ancient fabric was retained. In early Edwardian times the chancel underwent some work - new floor and the panelling around the sanctuary incorporating the reredos. The floor is of local Frosterly marble whilst the East window was slightly altered to raise three panels within their lights. ombs of the church were also moved to there current locations. 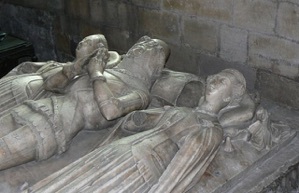 In the South West corner will be found the large alabaster tomb of Ralph Neville, 1st Earl of Westmoreland who died in 1425, and his two wives - Margaret Stafford, daughter of Hugh, Earl of Stafford, and Joan Beaufort, daughter of John of Gaunt and half sister of Henry IV. It was their daughter Cecily known as the Rose of Raby who married Richard Duke of York and was the mother of Edward IV and Richard III and from whom every British monarch is descended. 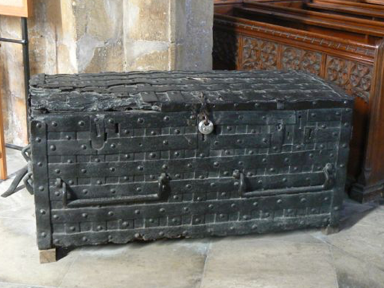 This important and magnificent tomb was probably donated by John of Gaunt using stone from his quarries at Tutbury. Great efforts to conserve this tomb have been undertaken in recent years but damage done by the reformers cannot be undone. Alongside there is an oak tomb which is that of Henry Neville who died in 1564, and his two wives, Anne, daughter of the Earl of Rutland, and Jane, daughter of Sir Richard Chalmondeley. The children of the marriage are carved in niches around the tomb. It was his son Charles who helped lead the Rising of the North for which he was attainted and the lands taken by the crown. Between them is a stone Effigy to Margery 2nd wife of Ralph Lord Neville c1343 the tomb slab is mounted on 4 Lions. In the North West corner the tombs are memorials to the Vane family. 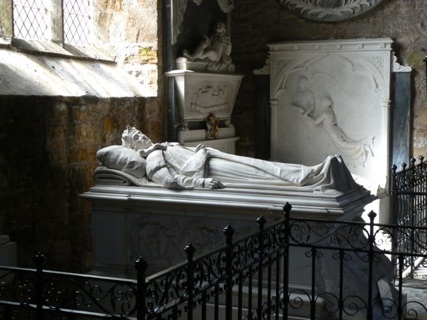 The central effigy is that of William Harry Vane, 1st Duke of Cleveland, and was sculptured in white marble by Richard Westmacott president of the Royal Academy. 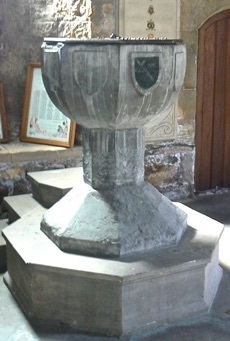 Between the two sets stands the font of 15th century Marble, also local - this time from Egglestone. It carries the arms of Lord Bergavenny (sixth son of the 1st Earl of Westmoreland - and his wife Elizabeth Beauchamp. The link between the Church and the Lords of Raby has persisted for nearly 900 years and the current Lord Barnard maintains that strong link. The families of Neville and Vane were also brought together when the 9th Lord Barnard married Catherine Sarah Cecil daughter of the 3rd Marquess of Exeter.